Have you ever wondered why worship services tend to start with a fast song and end with a slow one? This common practice is not one of personal choice or even of practicality. 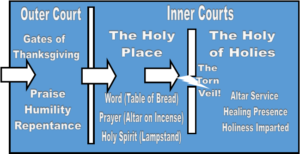 It is rooted in deep understandings of how the Bible instructs us to enter into the presence of the Lord. There is a protocol, a way it should be done. When we stop and think about this, it makes sense that the Scriptures would provide just such a pattern. The logical, reasonable, fitting and orderly way is the truth behind the structure of New Covenant liturgy—“the work of the people” in worship. 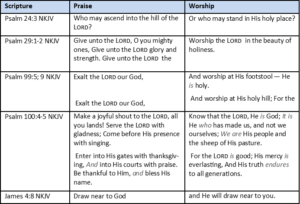 To understand this, it is necessary for us to understand the words we are using, especially, “praise and worship.” These terms are not synonyms. Sometimes we treat them as if they meant the same thing but they do not. What does the internet say? Verb: express warm approval or admiration of. “we can’t praise Chris enough—he did a brilliant job” Synonyms: commend, applaud, eulogize, compliment, congratulate, lionize, admire, hail, laud. Noun: the feeling or expression of reverence and adoration for a deity. “the worship of God” synonyms: reverence, veneration, adoration, glorification, glory, exaltation. What is the primary distinction? Praise is due to humans as well as to God. The New Testament tells us repeatedly that we are to honor, a form of praise, those among who are worthy. Parents do well to praise their children and to let them hear the deserved recognition of others from the mouths of their parents. Understanding this distinction, let us define praise and worship in the light of His presence. 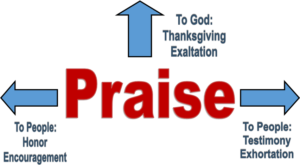 Praise is the expression of thanksgiving to the Lord and the exaltation of the Lord that brings us into His presence. Praise is the willful entrance into the presence of God by speaking forth thanksgiving to God and by exalting God’s name, His character, His mighty deeds, and His glory. Praise is a deliberate action of soul and body. We praise God by expressing gratitude to Him and by proclaiming His glory, deeds, and character. Praise is centered on God but is often expressed to others. We tell others how thankful we are or how great God is. The music of praise tends to be horizontal in direction, singing about God. 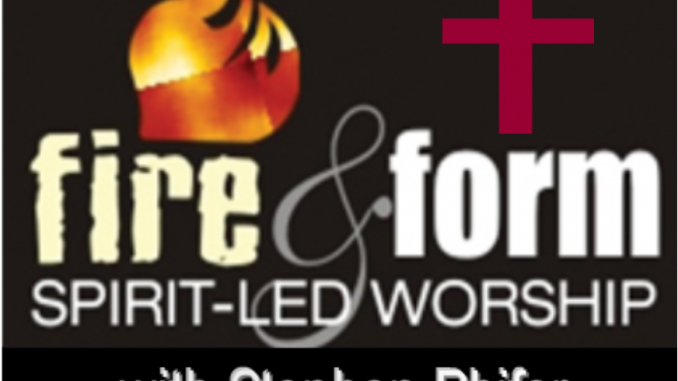 Worship is the expression of submission to God, adoration of Him, and commitment to Him. Worship is the willing response of our spirit to the revelation of the character of God by the moving of His Spirit in our hearts. Worship is the act of communing with God when we are in His presence. We worship God by expressing love for Him and commitment to Him. 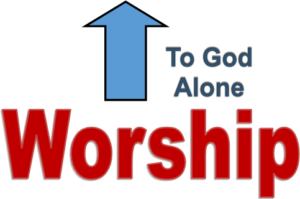 Worship is centered on God himself and is primarily expressed directly to Him, although many worshipful expressions of God’s glory can be directed to others. 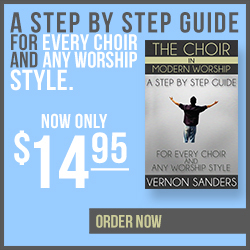 The music of worship tends to be vertical in direction, singing directly to the Lord—in other words, songs of prayer. Through praise, we enter the Lord’s presence. Through worship we respond to His presence. Repeatedly we are told in the Bible to enter into the Lord’s presence with praise and then to respond to His visitation with worship. When the Lord grants worshipers the deep sense of His Manifest presence, we respond with worship: adoration, devotion, commitment, communing with Him. This illustration describes this reasonable praise-to-worship sequence. This is a key to understand how worship is planned and led. Of course the great biblical illustration of this is the Tabernacle/Temple Model. It is the Old Covenant illustration of our New Covenant reality. 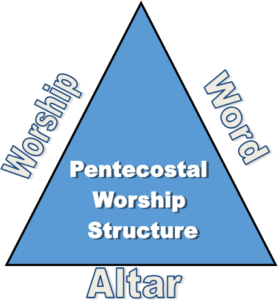 The Classical Pentecostal worship structure conforms to this biblical pattern.